Home » News » Congratulations, EVO Class of 2018! Congratulations, EVO Class of 2018! Congratulations to the EVO senior class of 2018! 28 students graduated the EVOLUTIONS program at the end-of-year ceremony on May 12. The newest group of EVO alumni has continuously shown their leadership and talent throughout their final year in the program, through event planning, mentoring of younger students, leadership in the Sci.CORPS program, and much, much more. While we will miss the senior bunch incredibly, we are excited for their plans to pursue higher education at UCONN, Eastern Connecticut State University, Temple University, Bowie State, Southern Connecticut State University, Gateway Community College, University of Bridgeport, Worcester Polytechnic, Vanderbilt University, and Yale. 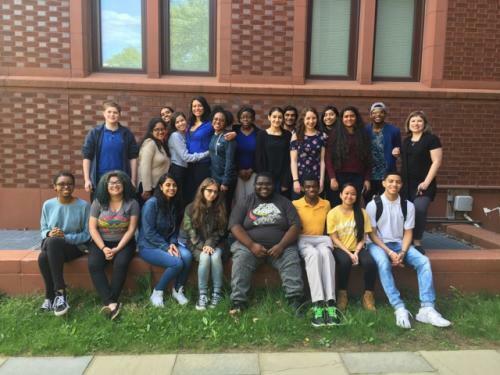 The 2018 class includes 4 Sci.CORPS Fellows, a Questbridge scholar, an Intel International Science & Engineering Fair Finalist, a full-ride scholarship recipient, and 7 Yale admitees. We couldn’t be more proud of our 2018 graduates and all that they have accomplished! We wish them the very best in their future endeavors, and look forward to hearing from them and supporting them along the way!